Prior to coming to the Center, Nyesha would often get into fights when someone made her angry. Through her relationships with the Community Center staff, she learned how to control her anger. “I was a serious fighter, and I really was taught to channel my anger here. It kept me from having a criminal background,” she says. When talking about the relationships she formed with the staff, Nyesha said she was, and still is, very close with Serina Brown, Director of Community Center. 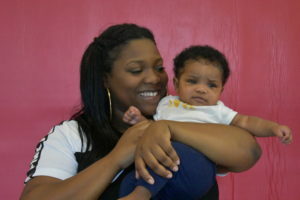 Serina became like a second mom to Nyesha during her years at the Center. High school is a formative time for most teens, and Nyesha was no different. For so many, choices made during this time can determine whether or not they make it to graduation and what direction their life takes afterwards. In 2016, the graduation rate from Harrisburg High School was 56%. Of students who had been enrolled in Bethesda Mission Community Center programming for 2 or more years, the graduation rate was 86%! In addition to increasing their chances of graduating, attending Community Center programming helps to prevent kids and teens from becoming addicted to alcohol or drugs. Even if their home life is good, there are a variety of outside influences that can affect their success. Nyesha graduated from high school in 2011 and now has 3 kids of her own, a 7-year-old daughter, a 3-year-old son, and a 5-month-old daughter. She is a certified nursing assistant (CNA) and goes to school online for early childhood education. She hopes to work with kids once she finishes her degree. Since the Community Center is an extended family for Nyesha, it only makes sense that she would send her kids. This past summer was the first year her 7-year-old attended Community Center programming. “It was one of the scariest things in my life with kids that I had to do, but I trust the Center. She loves it! Oh my goodness, that’s all she talked about the whole summer. That’s all she talks about now. She can’t wait until next summer,” Nyesha says. She recommends that other Harrisburg parents send their children to the Community Center. “I just really would recommend that people who don’t want their kids to be on the streets, that they send them here, especially since it’s more common for boys to be on the streets. I’m definitely going to send my son here,” she says. 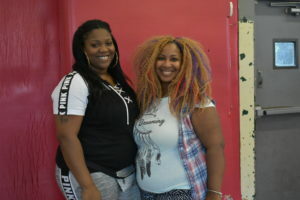 Her involvement at the Community Center prevented Nyesha from getting into serious trouble for fighting. It is a second home and extended family for her — one that she wants her own children to be involved in. Our Community Center staff mentors students to help them make good choices and be positive influences in their homes, schools, and communities. Have you heard about our campaign to complete the Community Center Building Project? Click here to learn how you can fireproof a life!